A sampler of preexisting stories, this book uses said stories to explore the experience of the seven deadly sins. Each story is specifically selected for its ability to exemplify one of the seven sins. The "Contents" lists two stories for each sin. 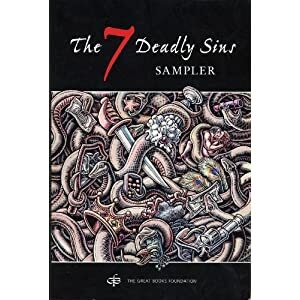 Following the contents is a "Foreword" which studies the definition of sin and the background of the ideas behind seven deadly sins that have become popularly known. These origins go back to St. Gregory and his "classification of the normal perils of the soul" (xii), with acknowledgement of other lists by Mahatma Gandhi and a BBC poll. It then investigates the definitions and dangers presented by each of the seven deadly sins. Next, the books provides a section called, "About Shared Inquiry". The book explains that "shared inquiry is the effort to achieve a more thorough understanding of a text by discussing questions, responses, and insights with others" (xxv). Five steps are listed as a guideline for this method: careful reading before discussion, supporting ideas with textual evidence, make sure to understand the ideas in the story before exploring those that go beyond, listen and respond directly to the other participants and the leader will only ask questions rather than answering them. After these instructions the reader is told "How to Use this Book" by discussing the fact that there are two sets of questions following each story. The first set are interpretive questions in which the reader attempts to understand what is actually going on in the story. The second set are evaluative which help to "weigh the significance or validity of the work in a larger context" (xxvii). A college literature course is the first audience that comes to mind when reading this book. It provides excellent material and questions for a classroom dialogue. Another audience that would benefit from this book would be a book club which focuses on conversation of literature. Finally, anybody with an interest in story collections which provide an exploration of the human condition would enjoy this compilation. The main part of the book is divided into sections for each of the seven deadly sins: Pride, Envy, Anger, Sloth, Greed, Gluttony, Lust. There are two stories for each sin, and personally it seems like one of the stories generally illustrate the idea of sin better than the other. These are preexisting stories by such celebrated authors as William Faulkner, Edith Wharton, D. H. Lawrence and Rudyard Kipling, etc. which have been compiled in an effort to epitomize each sin. I enjoyed this collection of thought provoking stories. Each one does a great job of exploring the nuances of each particular sin. Since I didn't have anybody to discuss the stories with, I didn't make full use of the discussion questions. Despite this, I believe the questions provide a great opportunity for discussion in a group setting. I would definitely recommend this collection of stories.